I have often referred to the signing of the document “Christian Witness in a Multi-Religious World” by the Vatican, the World Council of Churches, and the World Evangelical Alliance in 2011 as a crucial event in the history of the church. Now I was allowed to witness another event in Lund of at least equal importance. I am neither Catholic nor Lutheran. But what has happened here paves the way for all Protestant churches and confessions. And the presence of Orthodox representatives, even of the ancient oriental churches, such as the Syrian Orthodox Patriarch Aphrem II, proves that the results are perceived even by uninvolved third parties. In Lund, the Reformation year was opened not only by the Lutheran World Federation, but also by the Catholic Church, represented by the Pope. The event took place in the Cathedral of Lund in front of 450 invited guests, including King Carl Gustaf and Queen Sylvia of Sweden, the Swedish Prime Minister as well as other members of the government, national and international representatives of the Catholic Church and of the Lutheran Churches. Also present were leading representatives of the so-called Secretaries of Christian World Communions, that is to say the leaders of almost all Christian international denominations and umbrella organizations (from the Orthodox churches to the Salvation Army), among which the two largest, the World Council of Churches (WCC) and the World Evangelical Alliance (WEA), were represented by their Secretary Generals and a second delegate each. On a larger scale, the Lund event can be seen as part of a process of peace making within global Christianity. One could argue that, in a sense, Catholics and Lutherans signed a peace treaty. They regret having used armies, secular powers, and disinformation to fight each other, and they now want to deal with their differences through peaceful discussion, no longer using non-spiritual weapons. They will stop trusting in money, culture, power, and the state, but will instead trust the future of the churches to the power of the gospel, to which every Christian will bear witness and pass on with kindness. From my point of view as an Evangelical Christian, this vision has to be welcomed wholeheartedly. The so called sell-out of the Reformation, which has been announced by all sorts of critics and conspiracy theorists, has simply not taken place. In the liturgy of the worship service in the Cathedral of Lund, everyone prayed “Thanks be to you, O God, for the many guiding theological and spiritual insights that we have all received through the Reformation. Thanks be to you for the good transformation and reforms that were set in motion by the Reformation or by struggling with its challenges. Thanks be to you for the proclamation of the gospel that occurred during the Reformation and that since then has strengthened countless people to live lives of faith in Jesus Christ.” It cannot be said that Bishop Dr. Munib A. Younan from Jerusalem, President of the Lutheran World Federation, and his Secretary General, Martin Junge from Chile, would have been willing to water down their Lutheran identity for the purpose of a big media event. The Lutherans expressed their regret that the Reformation had been misused for political goals all too quickly and that the Protestants had not been able to prevent religious wars and the persecution of others. Both sides have distanced themselves from having spread lies about one another and from having been filled with hatred, which even led to war in many cases. But the core concerns of Luther, sola gratia along with his call for reform, were acknowledged as ground breaking by all participants. The Pope said: “The spiritual experience of Martin Luther challenges us to remember that apart from God we can do nothing. ‘How can I get a propitious God?’ This is the question that haunted Luther. In effect, the question of a just relationship with God is the decisive question for our lives. As we know, Luther encountered that propitious God in the Good News of Jesus, incarnate, dead and risen. With the concept “by grace alone,” he reminds us that God always takes the initiative, prior to any human response, even as he seeks to awaken that response. The doctrine of justification thus expresses the essence of human existence before God.” Especially in modern Protestantism there are many who have not understood Luther as well as this statement and surely it also reminds us, that Jesus Christ is the only way to salvation. Since the preparation of the event in Lund was of the utmost importance to the World Evangelical Alliance as well as to many other people, I not only talked with the leaders of the Lutheran World Federation very extensively, but also met with the Pope four times in recent weeks. From my personal observation and interaction, Pope Francis is aware, that in the 16th century, corruption did win over reform and is deeply convinced that the Holy Scripture, the Gospel, and the Holy Spirit possess the required power to lead the churches to a greater unity in the long term, if we put God’s iniative and saving grace first, and to enable each Christian to personally witness about salvation and hope in Jesus Christ to a dying world. Indeed, with his words the Pope was only drawing conclusions arising from the fact that the Vatican and the Lutheran World Federation, after years of intense work, had agreed on a short definition of the doctrine of justification, which summarizes the NT view, especially Paul’s. 17 years later, this accordance can lead to practical implementation, not hastily but in a prudent manner, not as if walking on thin ice but as a sustainable commonality. What is new is that the Pope sees justification as an absolute central question. Just shortly after his election I heard for the first time from Pope Francis that the common view of justification as salvation by grace and faith alone should be the center of our shared commonalities and that on this basis further steps would have to be taken. As is usual, Pope Francis has made his announcements come true, even though they initially sounded quite adventurous. In essence, the event was a celebration of the Reformation, not only by the presence of the Pope, but even at his invitation. Beyond all doubt, it was a remarkable step the Pope took towards Protestants, both symbolic and substantial. Of course this gesture was not presented only by the Pope. Many leading Catholic theologians, bishops, and cardinals had been actively involved in the preparations for many years. Just in time, the Pope tears down 500-year-old walls and replaces conflict by serious talks, self-criticism on both sides, and by the desire that the necessary disputes within Christianity should be shaped by love, not by the desire to defeat each other. 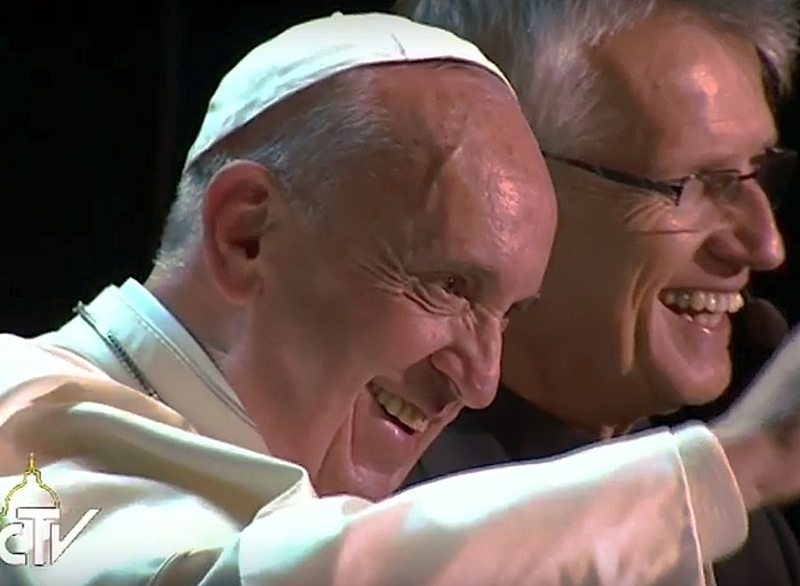 The Pope’s moving appeal in the Malmo arena to intensify ecumenical cooperation did not mean a hasty overcoming of the remaining deep theological differences between Catholics and Protestants. Instead, these differences would have to be thoroughly discussed, although the similarities certainly predominate. In this sense, he called World Christianity to show solidarity to a suffering world, and together help the poor, the sick, the oppressed, and the persecuted. The signing of a far-reaching cooperation agreement between Caritas International and the World Service of the Lutheran World Federation, which took place during the ceremony, underlines what is meant by this. This is reminiscent of the great commonality shown by all churches especially in the course of international refugee aid. It makes clear that theological differences should not be discussed at the expense of the needy, but as a common struggle for truth.